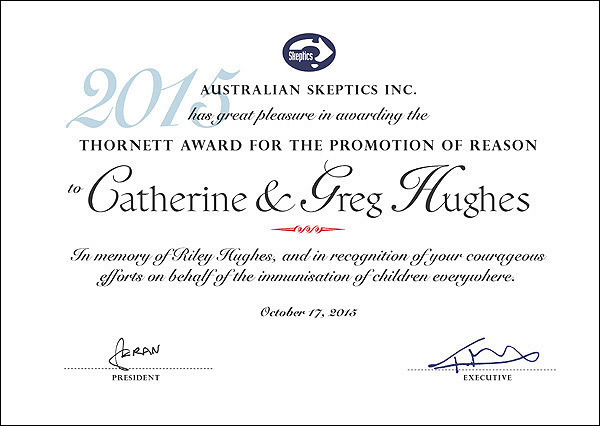 Two significant awards were announced at the Australian Skeptics annual convention in Brisbane. I wasn't able to attend the convention and forbade my friends from telling me what a good time they were having, but I know they were very enthusiastic in their applause when the awards were announced. Catherine and Greg lost their son Riley to whooping cough and have used their personal tragedy to encourage other parents to vaccinate their children. 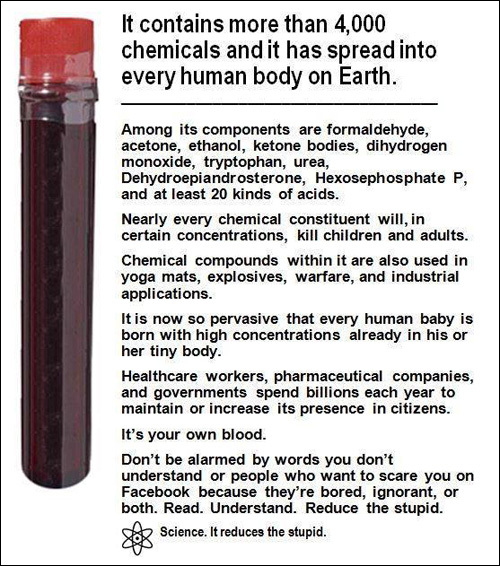 For this they have been vilified by anti-vaccination filth. They have been accused of being paid to support vaccines (of course), but the worst have been the accusations that Riley didn't even exist and is simply a fabrication of these Big Pharma shills. People ask me why I despise anti-vaccination liars and I can find no better justification than to point to the way that these vermin have attacked the Hughes family. You can show your support for Catherine and Greg by liking and following the Light For Riley Facebook page. Photo courtesy of the Sydney Moring Herald. James Brickwood was the photographer. The other award is the one that nobody covets - the Bent Spoon. 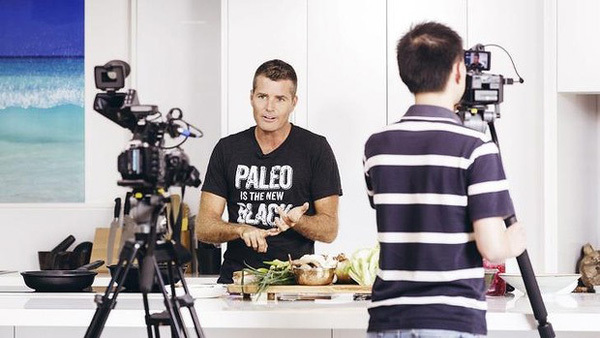 It is awarded to the "perpetrator of the most preposterous piece of paranormal or pseudo-scientific piffle" and this year went to celebrity TV chef Pete Evans for, among other things, his promotion of the ridiculous "Paleo Diet" which dictates eating like prehistoric cavemen. He had another award of sorts during the year when his book "Baby Yum Yum" was banned from sale because it contained "advice" which could have caused serious harm to babies if their parents had been foolish enough to follow the recipes. Evans is also opposed to fluoridation and includes uberquack Joseph Mercola among his pantheon of heroes. He is a worthy winner of any award granted to people who promote dangerous nonsense. On Tuesday, October 13, I had the great pleasure of sitting in Courtroom 22A and hearing Federal Court Judge Perry hand down judgment on homeopath Fran Sheffield and her Homeopathy Plus business. Ms Sheffield had attracted the ire of the authorities by claiming that homeopathy could be used as an effective substitute for pertussis vaccination. 5. Pursuant to s 224 of the Australian Consumer Law, the First Respondent pay to the Commonwealth within 30 days of the making of this Order by the Court a pecuniary penalty of $115,000 in respect of the acts constituting its contraventions of s 29(1)(a), (b) and (g) of the Australian Consumer Law. 6. Pursuant to s 224 of the Australian Consumer Law, the Second Respondent pay to the Commonwealth within 90 days of the making of this Order by the Court a pecuniary penalty of $23,000 in respect of the acts constituting her contraventions of s 29(1)(a), (b) and (g) of the Australian Consumer Law. 8. The Respondents pay the Applicant's costs of the proceeding as agreed or assessed. $138,000 in penalties, plus the ACCC's costs. The ACCC were employing one of the country's most expensive law firms and at one of the hearings they turned up with six of those wheelbarrows that lawyers use, each packed to the top with full three-ring binders. The photocopying charges by themselves could exceed the two court-ordered penalties. Ms Sheffield will have to sell a lot of bottles of water and very many hundreds-and-thousands cake decorations (at 15 cents each!) to pay these bills. You can read the full judgment here. The ACCC issued a media release which summed up the matter quite well. The Federal Court yesterday ordered Homeopathy Plus! 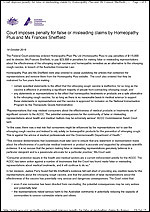 Pty Ltd (Homeopathy Plus) to pay penalties of $115,000 and its director, Ms Frances Sheffield, to pay $23,000 in penalties for making false or misleading representations about the effectiveness of the whooping cough vaccine and homeopathic remedies as an alternative to the whooping cough vaccine, in breach of the Australian Consumer Law. 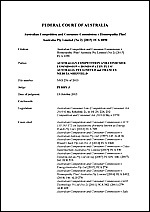 any statements or representations to the effect that homeopathic treatments or products are a safe alternative to the whooping cough vaccine, for so long as there is no reasonable basis in medical science to support those statements or representations and the vaccine is approved for inclusion on the National Immunisation Program by the Therapeutic Goods Administration. "Representations that may mislead consumers about the effectiveness of medical products or treatments are of significant concern to the ACCC. The potential consequences for the community of false or misleading representations about health and medical matters may be extremely serious" ACCC Commissioner Sarah Court said. "In this case, there was a real risk that consumers might be influenced by the representations not to use the whooping cough vaccine and instead to rely solely on homeopathic products for the prevention of whooping cough. This is against the advice of medical professionals and the Commonwealth Department of Health." "this decision demonstrates that businesses must take care to ensure that any statement or representation made about the effectiveness of a particular medical treatment or product is accurate and supported by adequate scientific evidence. It is no excuse that the person making false or misleading representations genuinely believes in a particular viewpoint and is a passionate advocate for a particular practice," [the] Court said. "Consumer protection issues in the health and medical sectors are a current enforcement priority for the ACCC. The ACCC has taken action against a number of businesses that the Court has found made false or misleading representations about medical treatments, and it will continue to do so." the representations conveyed that homeopathy was a safe alternative means of preventing whooping cough, despite there being no reasonable basis in medical science for the representation. The Homeopathy Plus website contained statements to the effect that the whooping cough vaccine is "unreliable at best" and "largely ineffective" in preventing whooping cough, and that homeopathic remedies are a proven safe and effective alternative for the prevention of whooping cough. when in fact the whooping cough vaccine is effective in protecting a significant majority of people from contracting whooping cough. The Court also found that Homeopathy Plus and Ms Sheffield engaged in misleading and deceptive conduct and made false and misleading representations to the effect that there was an adequate foundation in medical science for the statement that homeopathic treatments are a safe and effective alternative to the whooping cough vaccine, when in fact no such foundation exists and the vaccine is the only treatment currently approved for use and accepted by medical practitioners for the prevention of whooping cough. Whooping cough is a highly infectious respiratory disease which is most serious in young children. The Australian Government Department of Health recommends children receive the whooping cough vaccine as part of routine childhood immunisation. 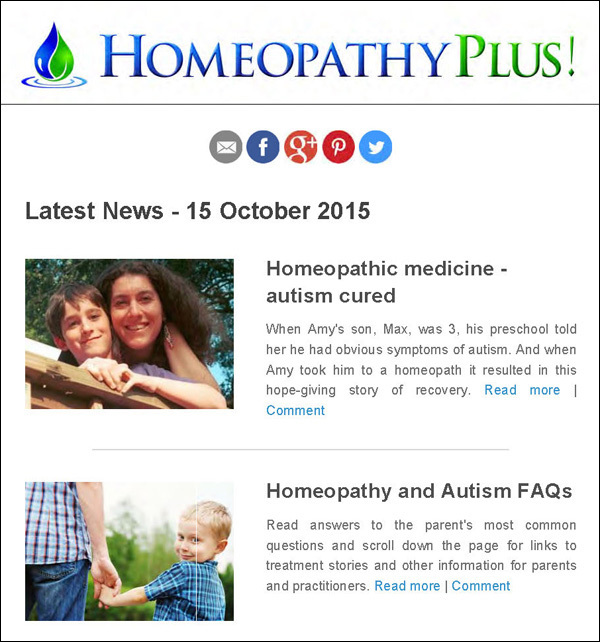 In April 2012, Homeopathy Plus removed representations from its website at the request of the ACCC, after the ACCC had expressed concerns they were misleading. Similar claims were then reinstated in January 2013, after which the ACCC to instituted proceedings against Homeopathy Plus and Ms Sheffield. them. I suggested that the perfect food would be something that we shared 100% of our genes with. Of the 95,727 children in the study, around 1 percent (994) were diagnosed with autism during the study's follow-up period. Among those who had an older sibling with autism (1,929), approximately 7 percent (134) developed the disorder. This difference in autism prevalence - between children with or without an older sibling affected by autism - is consistent with earlier studies. Note that the rate of autism increased by a factor of seven if an older sibling was autistic, but it's nothing to do with genetics, oh no! You can read the study here. Liars gonna lie. Scammers gonna ask for money. My latest column for Australasian Science magazine will be in the newsagents and your postboxes next week so I will write about it then. In the meantime here's my second-latest column (which you would already have seen if you were a subscriber - hint, hint). The weather is getting warmer so I should soon be able to dispense with the fleecy slippers and get fully into character to write a column called "The Naked Skeptic". Which reminds me - the editor forgot to send out his monthly reminder to all contributors so we all got a shock about how close the next deadline is. I had better start thinking about what I can write about. We celebrate by finding that the loophole wasn't closed when the act was rewritten and renamed and is still being used to drive pyramid-shaped money-stealing trucks through the protection that people would assume the law provides for them. The Federal Court found that: 'there can be no doubting the fact that inducements were held out to prospective Members that they would ultimately receive "financial benefits" other than the discounts they received on purchases made from Loyalty Merchants'. The Court made similar findings about "referral selling" conduct. Justice Flick noted:''the manner in which pyramid selling schemes operate...is "complex and elusive." The present Lyoness Loyalty Program is no exception'. ACCC Chairman Rod Sims said: "The judgment echoed some of the concerns the ACCC had with the scheme, in particular its complexity and the inducements that were held to prospective members". 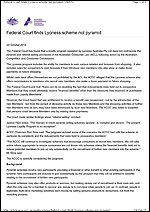 "the ACCC will continue to investigate schemes that encourage consumers to recruit new members. We will take action where appropriate to ensure consumers are not drawn into schemes where the financial benefits held out to induce potential members to join up rely substantially on the recruitment of further new members into the scheme," Mr Sims said. 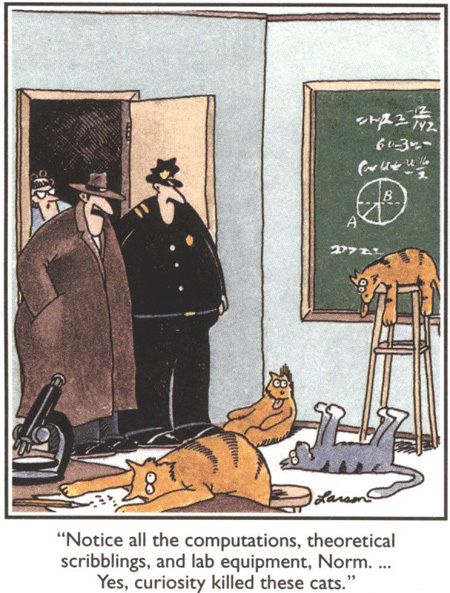 Despite being hopeless at mathematics at any level above arithmetic and algebra, I have a fascination for the way people misunderstand and misuse numbers. My latest column for Australasian Science magazine is about some numbers that people don't seem to understand. It's in letterboxes and newsagents now, but I encourage you to subscribe. The annual cost is less than you would spend on the coffee you drink while reading it. Thank you to someone. If anyone knows who that someone is, please let me know. Well, for certain values of "intelligence" anyway. 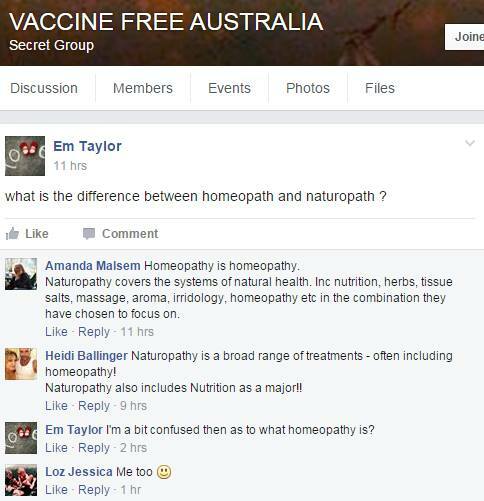 Supporters of alternative "medicine" who know all about how it works and what it is. Random selections from the inbox. For some reason people occasionally email me offering to improve the search engine ranking of the site belonging to ex-Dr Rebecca Carley, darling of anti-vaccination liars and insane with a certificate to prove it. This made a change. Someone wants to sell me batteries. Someone missing the point entirely. Also "you're" and "data's" (I love the Apostrophe Man's treatment of a word that is already plural). Original colour retained, and I don't know why some parts were highlighted. I was going through you're webside and understood that you're specialized in chiropractic products and services. We are dealing with list of hospitals, clinics, national pharmacy companies, decision makers, healthcare professionals, distributors and sales reps, worldwide. 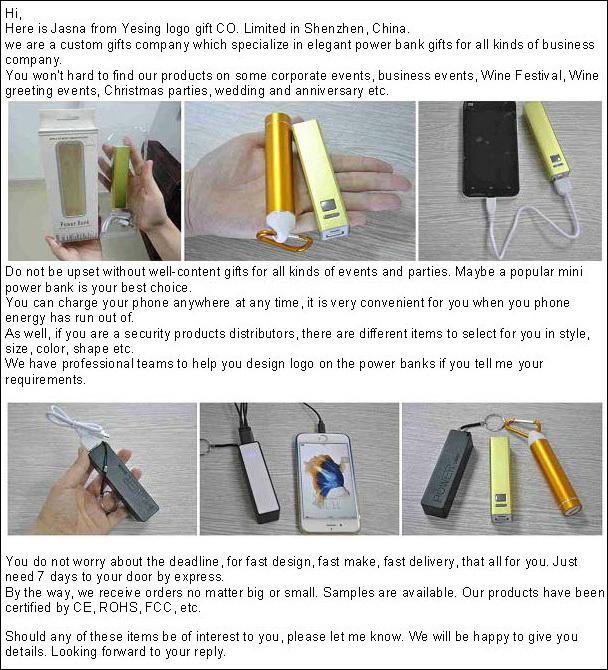 If you're interested in our products and services .I can share few data's and you can directly contact them through email or by phone and expand your business worldwide. Let me know the below format so that I can send a few samples for your review..